The Nazis had very firm ideas about the role of women in Germany. Hitler thought that the population of Germany had to increase for the country to become more powerful. Therefore women were forced to give up work and have children. 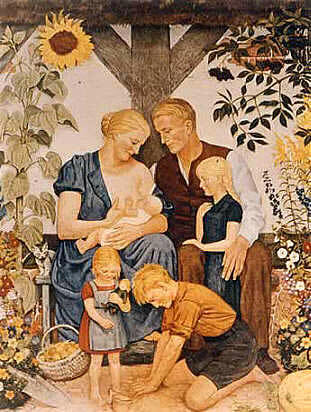 On 5th July 1933 the Law for the Encouragement of Marriage was passed. This act gave all newly wed couples a loan of 1000 marks which was reduced by 25% for each child they had. If the couple went on to have four children the loan was wiped out. Unmarried women were also encouraged to have children and for those without a husband they could visit the local Lebensborn where they could be made pregnant by a racially pure member of the SS. Hitler reduced women's social activity to a purely biological purpose. It was their duty to assure the future of the German race. To encourage this policy, he offered rewards to women such as marriage loans, tax allowances, and health services. He even praised the women for their "services to the state and race" publicly. As a result, they were more willing to comply with such a program. Once again, German women failed to oppose the forces of history. Instead of insisting on all that they had accomplished during the Weimar Republic, German women let themselves be manipulated by Hitler and accepted their traditional role of a housewife. Interestingly, many women supported the National Socialist Party because it urged returning to the family values of the past when women were encouraged to stay at home and concern themselves with taking care of the household. There were many women in Germany who felt burdened by their new political responsibilities and had the desire to return to this simpler way of life. As a result, during this period the number of women enrolled in the universities declined dramatically, and women were encouraged to drop out of the labor force, marry and bear children. Women were expected to stay at home and occupy themselves with their kids, home and the church - the echo of Kaiser Wilhelm's witticism. They were not supposed to work and there were even medals for women who had a large family. Three million women won a medal for having four or more children in 1939. It was thought to be particularly important to marry people who fit the physical ideal so that the German nation would remain pure. 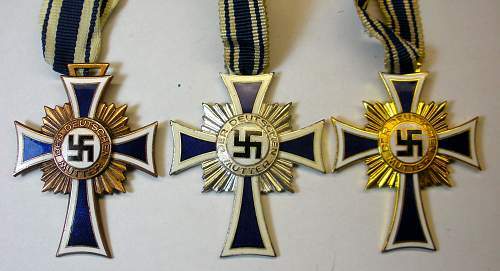 Hitler instituted the Mother's Cross, to encourage German women to have more children, to be awarded each year on August 12, Hitler's mother's birthday. The decoration was conferred from between 1939 until 1945 in three classes of order - bronze (4-5 children), silver (6-7 children), and gold (8 or more children). 1. Remember that you are a German. 5. As a German choose only a spouse of the same or Nordic blood. 6. In choosing a spouse ask about his ancestors. 9. Don't look for a playmate but for a companion for marriage. There were also many women who opposed the Nazi party. It is difficult to estimate the number of these women because most showed their opposition simply by not doing anything to support the party. Those few women who publicly made their opinion known often suffered severe consequences for standing up to the Nazi party, such as exile, death in concentration camps, or committing suicide.  Küche, Kirche, Kinder, ... Krieg?